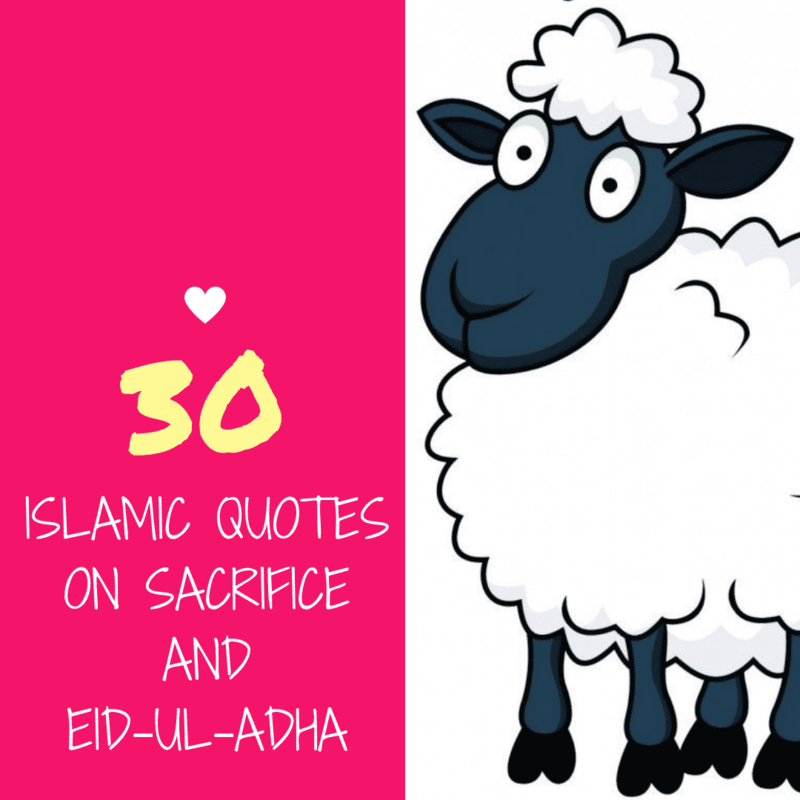 Islamic quotes on Sacrifice and Eid ul Adha. Eid ul Adha is celebrated on the 10th of Dhul- Hajj, in the remembrance of Hazrat Ibrahim AS sacrifice. 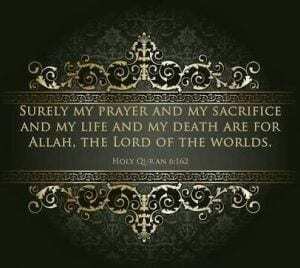 He was asked my Allah SWT in a dream to slaughter his own son, Hazrat Isma’il AS. Ibrahim AS bow down in front of Allah’s command and prepared himself to slaughter his son. 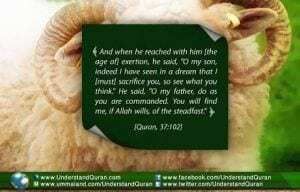 Allah SWT helped him and replaced his son with a sheep at the time of slaughtering. Sacrificing animals is the essence of Eid ul Adha. But sacrificing doesn’t only mean to cut the animal and eat the meat, but it basically means to sacrifice what we love in the path of Allah. In abstract sense, it means to let go of your attachments and love for dunya for the sake of Allah SWT. And that is the true meaning of sacrifice in Islam. 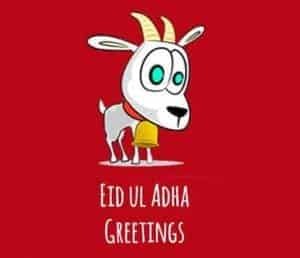 Eid al Adha is celebrated in remembrance of Hazrat Ibrahim AS who willingly went to sacrifice his son on Allah’s command but as He’s the most merciful, He replaced Ismail AS with a sheep. 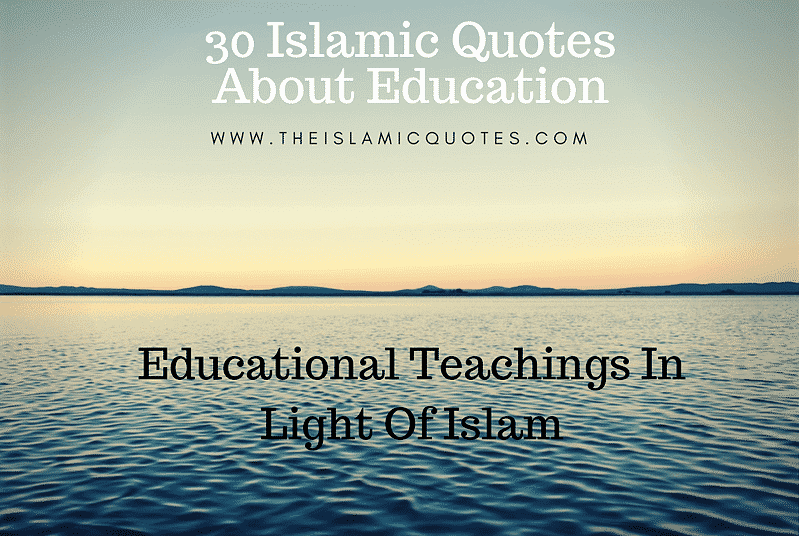 Also have a look at these 30+ Eid Wishes, Messages & Quotes. 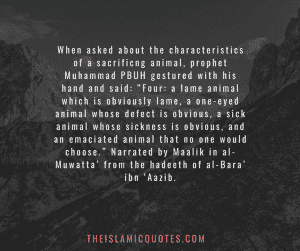 When we read about sacrifice means sacrificing animals in the path of Allah in the remembrance of Hazrat Ibrahim AS, who was asked by Allah SWT to slaughter his son Hazrat Isma’il AS. 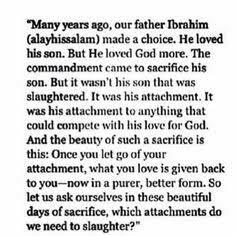 But in the abstract sense, sacrifice in Islam basically means is to let go of what you love and tie attachment for the sake of Allah SWT. 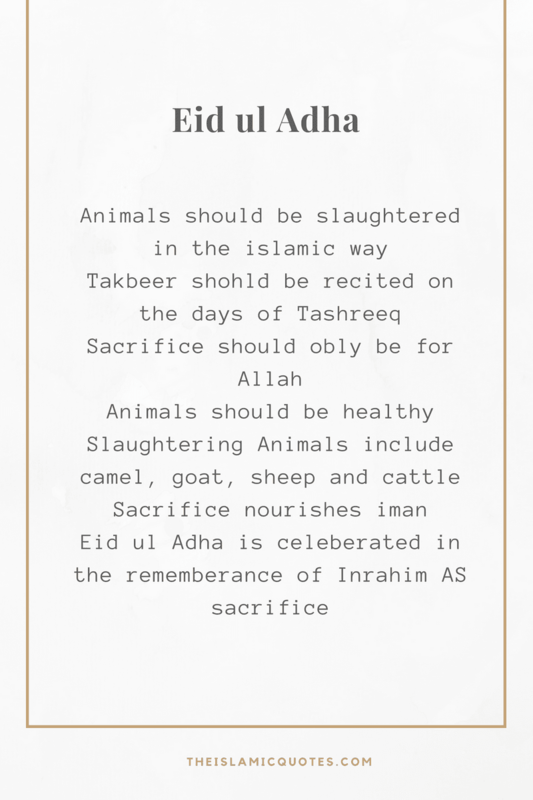 On Eid ul Adha, we sacrifice animals in the remembrance of Hazrat Ibrahim AS. But we should know the purpose behind it. Allah SWT had asked him to slaughter his own son from his own hands. Ibrahim AS didn’t protest over this command of Allah SWT. Allah SWT replaced his son with a ram. It is not that the animal that we sacrifice, the purpose is to make sure that we sacrifice ou attachments and love for materialistic things for the sake of One and Only true God, Allah SWT. 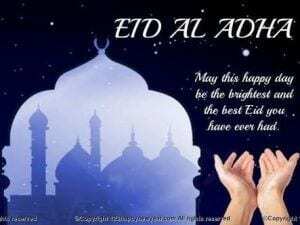 Muslims all over the world celebrate Eid ul Adha with great joy. It is farz on people who can afford to slaught animals in the path of Allah SWT. 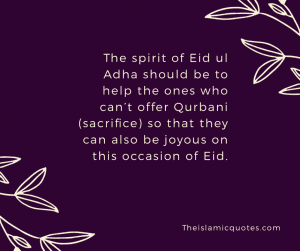 Allah in the Quran himself talks about sacrifice and Eid ul Adha. We sacrifice animals in the name of Allah SWT so that means our sacrifices should only be for Him. We slaughter our animals only for the sake of Allah and according to his commands. It shouldn’t be for anyone else. Here are 50 Best Jumma Mubarak SMS, Messages and Wallpapers. When performing Qurbani, one has to take precautions before the Eid day. Prophet Muhammad has taught his ummah that one who is offering Qurbani shouldn’t cut his nails and hair before slaughtering the animals. 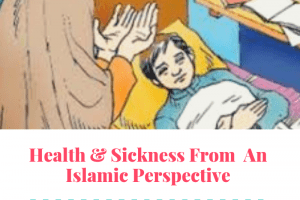 We should make all the hygienic preparations before the moon of Dhul- Hajj is sighted. Before Eid prayers one shouldn’t eat anything. After Qurbani, nails and hair be cut and one should eat from the meat of the sacrificing animals. The sacrificing animals include, cattle, camels, sheep and goat. 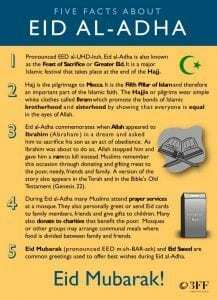 Eid ul Adha is a sacred festival for the Muslims all over the world. To slaughter animals after the Eid prayers is the Sunnah. 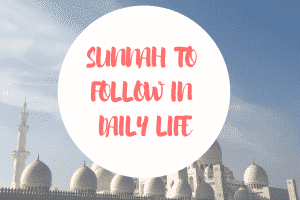 We should follow Sunnah on every step on this day. Allah has given us this joyous occasion of Eid ul Adha and all the Muslims offer Eid prayers. 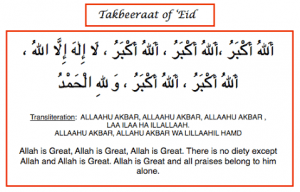 The takbeer should be recited on the Eid day and all Tashreeq days. 3) One that cannot walk properly or that is lame. 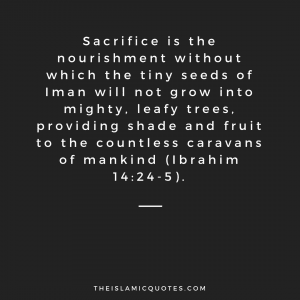 Sacrifice is the nourishment without which the tiny seeds of Iman will not grow into mighty, leafy trees, providing shade and fruit to the countless caravans of mankind (Ibrahim 14:24-5). There is an Islamic way of method of slaughtering animals without which the sacrifice isn’t accepted. 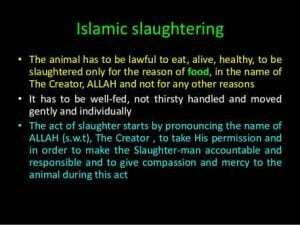 5) The name of Allah should be mentioned while slaughtering the animal. 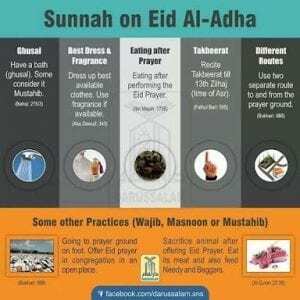 Prophet Muhammad has said in a clear manner that Muslims shouldn’t fast on Eid ul Fitr and Eid ul Adha. 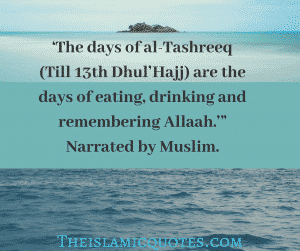 We can fast on any day except for these two occasions. He says that Eid ul Adha is for drinking, eating and praising Allah SWT. The sacrifice of animals should only take place after the Eid prayers. Those who slaughter before Eid prayers, their sacrifice isn’t accepted. 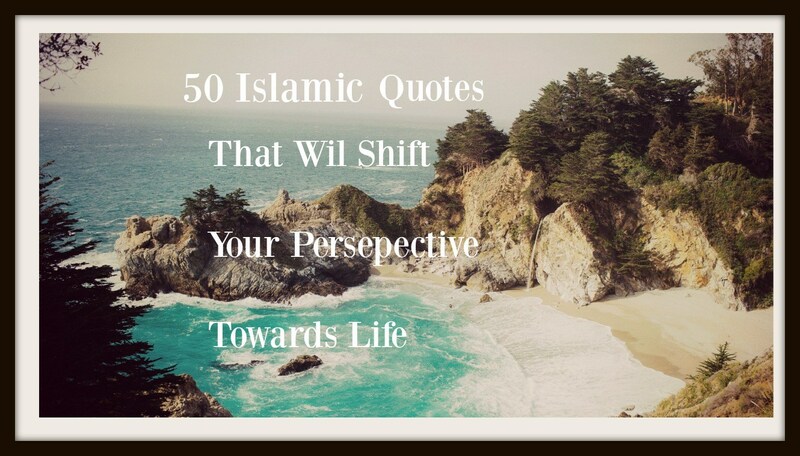 Do have a look at these 30 Inspirational Islamic Quotes On Gossiping & Backbiting. There should be certain abilities and characteristics that are needed to sacrifice in the path of Allah and for the sake Him only. The sacrifice that we make for Allah SWT should only be for Him and not for the people. One shouldn’t show their animals off to people and brag about the price they paid for an animal. 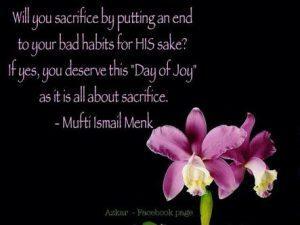 The sacrifice should only for the sake of Allah. Sacrificing in a halal way should be the only way to slaughter an animal. It should be slaughtered in an Islamic way by cutting the windpipe and two jugular veins. 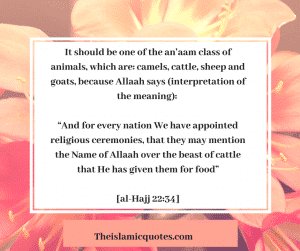 The name of Allah should be mentioned before slaughtering to make the Qurbani halal. 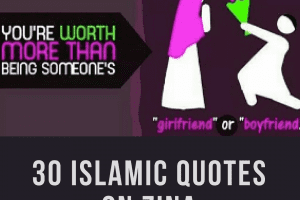 If the name of Allah isn’t invoked intentionally, the sacrifice isn’t considered halal. 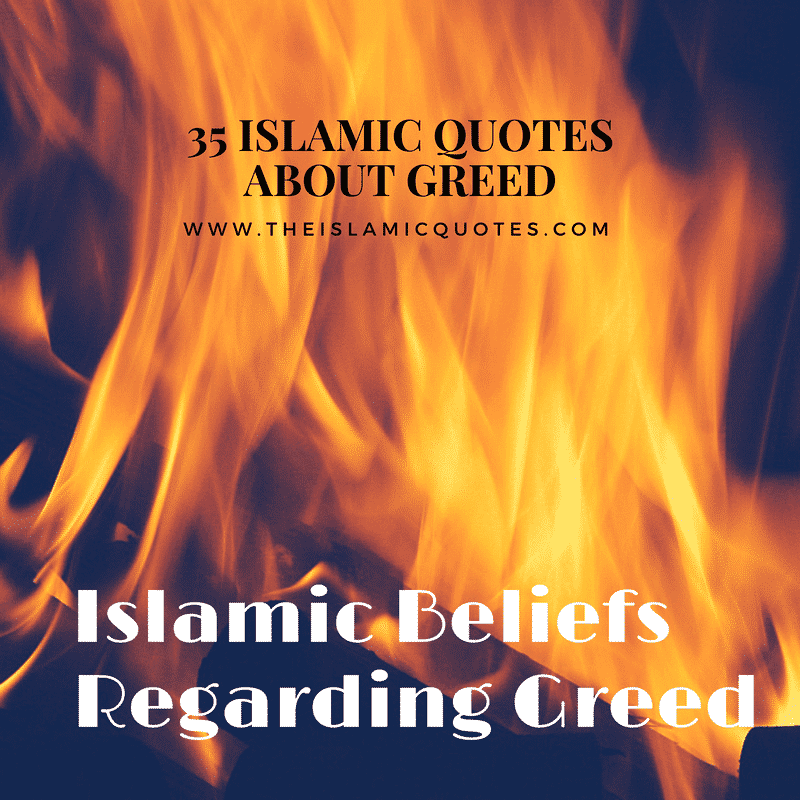 If it’s not invoked unintentionally then the sacrifice isn’t considered haram. 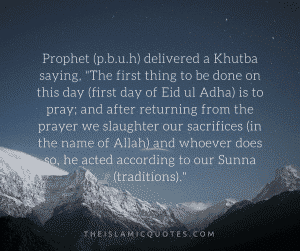 Eid ul Adha is way to worship Allah SWT. On this day we sacrifice animals in the path of Allah SWT and according to prophet Muhammad, this day is only for the worship of Allah. Muslims should thank Allah SWT to be able to celebrate this day of joy. 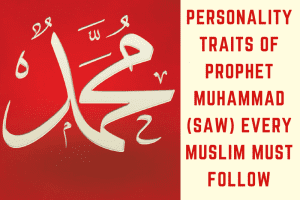 We should thank Him that He has given us the opportunity to afford the sacrifice and also thank Him to make us Muslims. 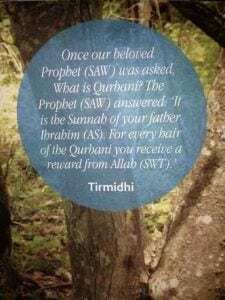 Muslims should offer Qurbani and sacrifice animals and give lots of sadqah. We should spend for the sake of Allah SWT and help the poor by giving sadqah. 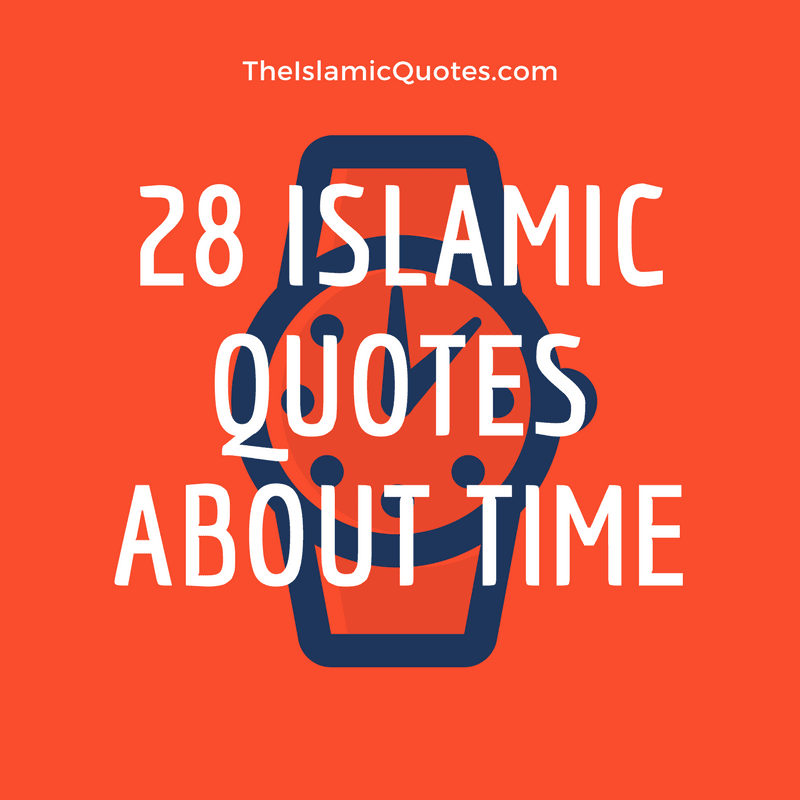 Here are 20+ Islamic Quotes on Charity-Aayahs and hadiths on Sadqah. 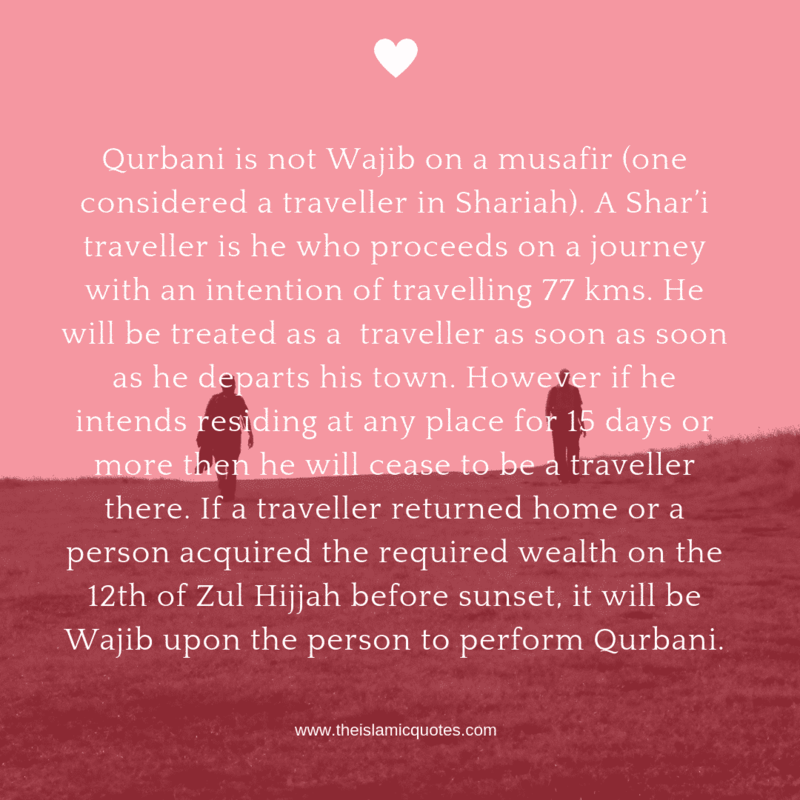 During Hajj, the hujjaj perform the rituals that are required and farz for the completion of hajj . 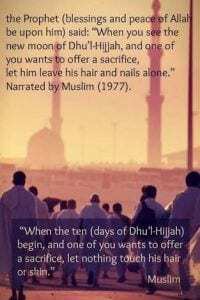 On the 10th of Dhul hajj, the hujjaj perform Qurbani and slaughter the animals. Their sacrifice take place after hajj. The meat should be divided between the relatives, poor and people who slaughter the animal. The animals that are under the care of people for sacrifice, should be taken care of properly. They should be loved and fed in a proper manner as they are sacrificed in the path of Allah SWT. 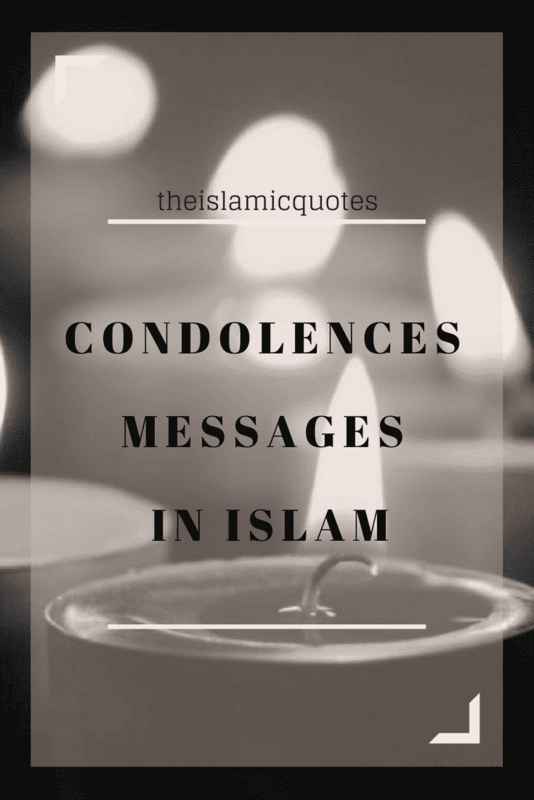 The Muslims should clean their heart from any resentment and hatred and spread only love. They should come forward with open arms and speak the language of love as Eid ul Adha is all about love and joy. Muslimsd should greet people by hugging three times. It is the ritual that has been a part of both Eid. 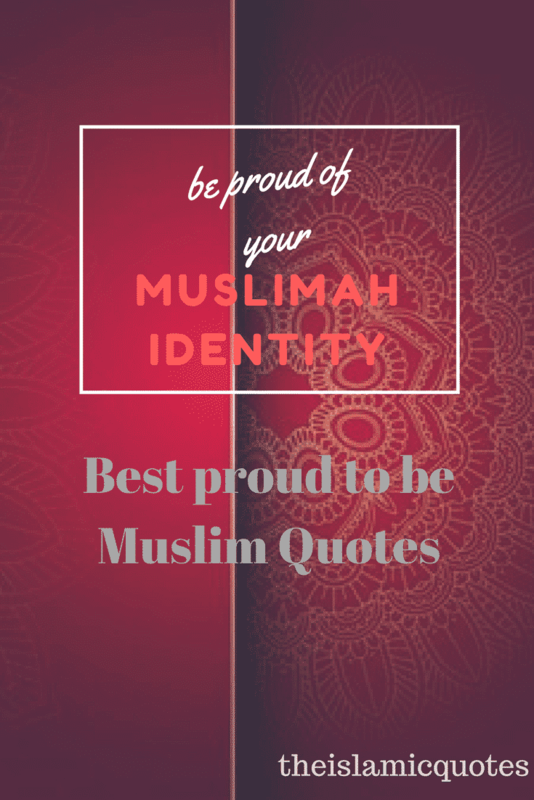 Muslims should open up their hearts with love and greet everyone with joy.